If you follow my blog or newsletters, you may have noticed that I write. Compulsively. Voluminously. As in, with lots and lots and lots of words, often of more than two syllables. It's who I am. During last years' Dry Eye Awareness Month I was so writing-deprived that I really let it fly. If memory serves, the only graphics I used on those interminable blog posts of 2017 were word clouds. And this year, if you've read my first few posts of Dry Eye Awareness Month 2018, you may have noticed I have not yet departed too far from my norm. I know that writing like this narrows my audience to those who won't glaze over after the first sixteen paragraphs... but I can't help myself. I absolutely recognize the role and value of snappy taglines, quick soundbites and compact messages in today's world. That type of communication is immensely useful in educating people, especially against their will. But I leave that kind of writing to the pros. It's just not my thing. So, enjoy the pithy dry eye blurbs cranked out by the industry and the eyecare professions during Dry Eye Awarenes month, and if you find yourself craving my circumlocutory dry eye discourses and diatribes, you can always circle back here. It's easy to remember. And (ugh) re-tweet friendly. It's useful for people who already have dry eye. Drink up: Whole body hydration matters to your eyes. Get your full allowance of water every day, and be especially careful if you're in a dry environment or are drinking drying things. 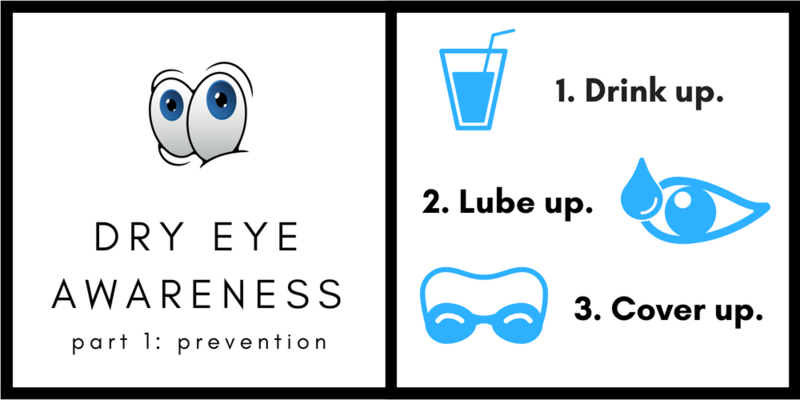 Lube up: Use safe eye lubricants proactively, preventively, not just reactively. Don't let symptoms escalate. Remember that actual dryness can precede the sensation of dryness. Cover up: Day and night, physical barrier protection for your eyes helps keep the moisture in. The most common form of dry eye is evaporative - and you can reduce the effects of it by keeping the space immediately around your eyes protected and moisture-rich. Where did Drink Up, Lube Up, Cover Up originate? It goes way back in the annals of Dry Eye Zone history. In fact, it probably predates the Dry Eye Zone, though it's too long ago now for me to remember for sure. I first heard "Drink up, lube up, cover up" from a very dear old friend who passed away about five years ago. Phyllis Knapp was known as The Dry Eye Queen on DryEyeTalk forums, and before that on D'Eyealogues, and before that on SurgicalEyes, where we post refractive patients used to congregate looking for support and solutions in the days before Facebook groups. Phyllis was one of the old guard... Along with Cindy, one of the best people ever to happen to those online groups (do you remember the Lucy and Ethel days?) and (little known fact) a DryEyeCompany co-founder! and Mary a/k/a Gloomsburg who, as a communications professor, sympathized with my word obsessions. (Mary passed away a few years before Phyllis.) There are so, so many others, some of whom still put in occasional appearances in the forums or groups. Phyllis was such a straight shooter. No nonsense. Always right to the point. No wonder she could pack so much practicality into six words. The Dry Eye Queen earned her name. She had much to contend with. Like me, she had both vision issues and dry eye stemming from LASIK, but she had it in many ways much worse than me. Her Sjogrens diagnosis (generally considered a contraindication for LASIK) came too late to save her from all the issues LASIK introduced; she underwent LASIK in the early days when dry eye screening was terribly inadequate - a problem that, as we know, persists twenty years later though to a lesser extent.